* Homes, Condominiums and Apartments Built Before 1978 Often Have Paint that is Lead-Based? * Lead Can Enter Your Body When You Inhale or Swallow Lead Dust, or When You Eat Soil or Paint Chips Containing Lead? * Lead Exposure is Particularly Dangerous to Infants and Young Children? It could potentially harm a baby EVEN BEFORE IT’S BORN. In fact, lead paint poisoning affects over one million children today. Adverse health effects include learning disabilities, behavioral problems, and speech delays – and could result in slowed growth, hearing problems, even damage to the brain and nervous system. * Even Adults Who Are Exposed to Lead Can Experience Reproductive Issues, Hypertension/High Blood Pressure, Nerve Disorders, Muscle & Joint Pain, and Memory & Concentration Problems? 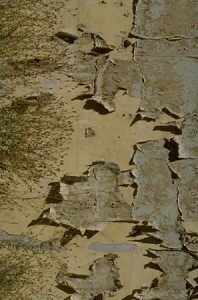 * Improper Removal of Lead-based Paint Can Increase the Danger to You and Your Family? On April 22, 2008, the United States Environmental Protection Agency issued a rule requiring the use of lead-safe work practices aimed at preventing lead poisoning in children. As of April 22, 2010, federal law now requires that contractors performing renovation, repair and painting projects that disturb more than six square feet of paint in homes, childcare facilities, and schools built before 1978 must be certified and trained to follow specific work practices to prevent lead contamination. To become a certified renovator, individuals are required to take eight hours of training, of which two hours must be hands-on training, to become certified. This training is good for five years, at which time the certification must be renewed. Highlight Homes Principal, Tony Pourhassan and Superintendent, Chris Gilliam recently completed their training and certification through the U.S. Environmental Protection Agency – making Highlight Home Restoration a Lead-Safe Certified Firm. In the event that you and your family live in a home that was built prior to 1978 and wish to complete a home renovation, we encourage you to contact Highlight Home Restoration or a fellow Lead-Safe Certified Firm to handle the project for you. Highlight Home Restoration will follow all the EPA’s guidelines and protection measures to safeguard your family’s health. To learn more about the dangers of lead poisoning and the facts behind the mandate, read our blog “Get the Lead Out” or visit the EPA’s Lead Paint Webpage. When you’re ready to get started on your next renovation project, call Highlight Home Restoration’s professional team of contractors and renovators at 678-873-9234, fill out our online contact form, or e-mail your request to info@highlighthomesga.com. We are truly honored that you would consider us to protect the well-being of your family while we create unique living spaces where you and your family will make memories together for years to come! 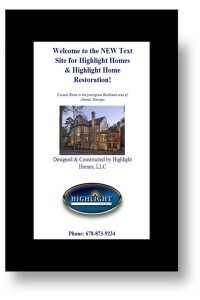 To stay on top in this ever-changing, technology driven planet of ours – all while “keeping it green” and providing a clear, concise message about WHO we are and WHAT we do – Georgia builder Highlight Homes, LLC has officially gone mobile with its own mobilezensm TextSitesm. If you’re scratching your head wondering what that means exactly – a mobile TextSitesm is basically a “digital business card” conveniently accessible by prospective clients and future associates; one that is comprehensive, immediate and helps eliminate the use of paper. Atlanta-based company mobilezen, Inc. – a Web-based service that allows individuals and businesses to communicate information direct to mobile phones via text messaging and mobile web – is quickly gaining traction as one of the country’s leading mobile information providers. Highlight Homes is proud to join forces with them as we forge ahead together into this brave new digital age. By texting any one of our keywords, such as “HighlightHomes” or “HomeRenovation”, to mobilezen’s exclusively licensed number 99699 – a link to our mobile TextSitesm will be sent to your cell phone or mobile device within moments*. Our TextSitesm provides you with Highlight Home’s contact information, our company’s philosophy, our services, photos of our work and important links – all right there in the palm of your hand. We recognize the fact that – with nearly 1.5 TRILLION text messages sent in 2009 alone – this is a growing trend and could very well represent the wave of the future. To catch a sneak peek of Highlight Home’s NEW mobile TextSitesm, CLICK HERE or text “HighlightHomes” to 99699. To learn more about mobilezen, Inc. and ways that they could help YOUR business enter the digital age, visit www.mobilezen.com. While continually seeking new ways to get our message out in this busy world of ours, we remain committed to providing only the best in customer service and good old-fashioned quality construction to each and every one of our clients. While blogs, e-newsletters, websites and TextSites are all valuable tools in disseminating information about our company, you will still find a warm and welcoming voice at the other end of the phone line whenever you call us with a question or to request a bid for an upcoming renovation project. If you prefer conventional human contact over digital messaging, we invite you to call us at 678-873-9234 TODAY! * Message and data rates may apply to text message requests, which are assessed by the individual’s mobile phone carrier. Check with your mobile phone service provider to find out more about such charges. 1) Sunrooms Add Value – More and more homeowners are making the decision to stay in their current home longer and renovate rather than move. However, it’s always wise to address the concept of increasing your home’s market value in the event that you do decide to move in the future. By increasing the square footage of your home through a sunroom addition, you are adding value as well as elevating the aesthetic beauty to potential buyers. 2) Sunrooms Add Space – As stated in Terrific Reason #1, you are increasing the square footage or “liveable” space of your home when you add a sunroom. Depending on the design, you can also open up your floor plan and give the illusion of even more space through the incorporation of lots of windows. 3) Sunrooms Enhance Your Home’s Beauty – Inside & Out – Don’t think solely in terms of just making the home more attractive to future buyers, a sunroom – when designed and constructed properly – can give your home a more elegant and sophisticated flair both on the interior and from the exterior. If you have professionally designed landscaping or are a master gardener yourself, a sunroom is an ideal way to showcase your yard. 4) Sunrooms Allow You and Your Family to Enjoy the Outdoors Year-Round – In the Southeast, where the winters are relatively mild but the summers can be downright brutal, a sunroom offers the perfect escape from the harsh temperatures while allowing you to enjoy a night under the stars or an afternoon nap in the sunlight in the comfort of your climate controlled home. 5) Sunrooms Provide an Economical Way to Increase Living Space – The thought of a room addition can sometimes be daunting, but a sunroom is often built on a pre-poured patio slab or by enclosing a pre-existing porch or deck. Rather than building from the ground up with more expensive materials, a sunroom can be designed to fit your family’s needs, your home’s structure AND your budget. 6) Sunrooms Offer a Terrific “Flex” Space – A sunroom can be designed to serve any number of purposes: Indoor Garden, Reading Room, Entertainment Space, Children’s Playroom, the list goes on and on! 7) Sunrooms Can Often be Built Quickly, With Less Disruption to Your Family’s Life – Aside from expense, a room addition can be intimidating because of the way it may disrupt your home for sometimes months on end. Depending on how elaborate your design is, a sunroom can often be completed in weeks and – since it’s often an extension of your home, construction can be relatively non-invasive. 8) Sunrooms Provide Lots of Natural Light Which Can Equate to a More Energy Efficient Home – Known as “daylighting”, the use of natural light through energy efficient window systems in place of artificial lighting during the day could decrease your energy use significantly and is recommended by the U.S. Department of Energy. 9) Sunrooms Mean No More Raining On Your Parade and No More Bugs at Your Picnic – Sunrooms provide a terrific space for entertaining! In the event of an unexpected storm or a swarm of pesky yellow jackets, you can always bring the outside IN by hosting a party or indoor picnic in your new sunroom. 10) Sunrooms Help Redefine the Concept of the Family Room – That’s right, peel your eyes away from the TV and head to the sunroom tonight to star gaze with the kids, play your family’s favorite board games, or swap stories of the day’s events. At Highlight Home Restoration, we don’t just build rooms – we create living spaces where you and your family will make memories together for years to come. What are you waiting for? You could be enjoying a good book, a candlelit dinner under the stars, or a neighborhood gathering in your very own sunroom within weeks! When you’re ready to get started, the talented team of designers and builders at Highlight Home Restoration is eager to assist you in enhancing your home’s character and living area. Simply give us a call at 678-873-9234, fill out our online contact form, or e-mail your request to info@highlighthomesga.com. We look forward to the possibility of adding a little “light” to your family’s life! Cite: The 5th Dimension. 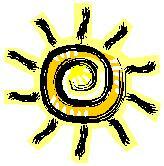 “Aquarius/Let The Sunshine In.” The Age of Aquarius. Soul City, 1969.